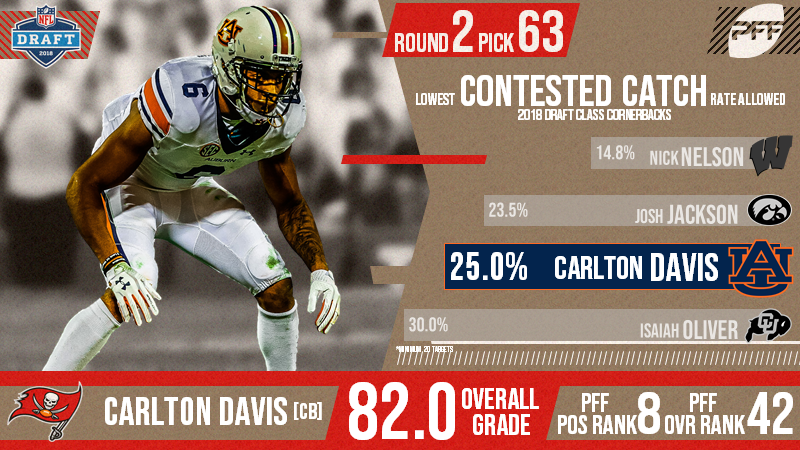 With the 63rd selection of the 2018 NFL Draft, the Tampa Bay Buccaneers have selected Carlton Davis. The former USC star was selected 63rd overall after finishing the 2017 season with an 82.0 overall grade. Allowed just 49.1 percent of passes thrown his way to be caught in 2017, gave up just 361 receiving yards all year. Allowed 1.01 yards per coverage snap in 2017, ranking 64th in the draft class.